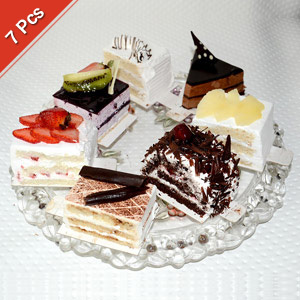 Send Assorted Taj Pastries - 7 pieces to Chennai. Gifts to Chennai. Send Cakes to Chennai. Description : Pastries as gifts are welcomed by all as these are not only tasty but also lightens your mood when you are feeling under the weather. Hence, these make wonderful gifts on any occasion or festival. With this in mind, Gift2Chennai.com brings you these assorted pastries from Taj which will definitely be appreciated as gifts by your dear ones. What makes these really special is that all come in various flavours( 3 to 5 different flavors). Thus, send these delicious pastries to your loved ones in Chennai and bring a big smile on their faces. Moreover, along with these, you can also send fabulous Gifts to Chennai as well. Please Note : Picture is indicative. Actual might vary.